Mr. Thennes, NHS Assistant Principal, approached Mr. Juarez to see if he was interested in having an art student design the front cover of next school year’s handbook. Without hesitation Mr. Juarez said, “yes”. The question was which student to approach with this challenge. Mr. Juarez approached junior Lauren H to see if she would be interested in this project knowing that she only had a couple of weeks to design something. She jumped on the artportunity. He knew he wanted a junior to design the cover so that the student can see his/her design in action. 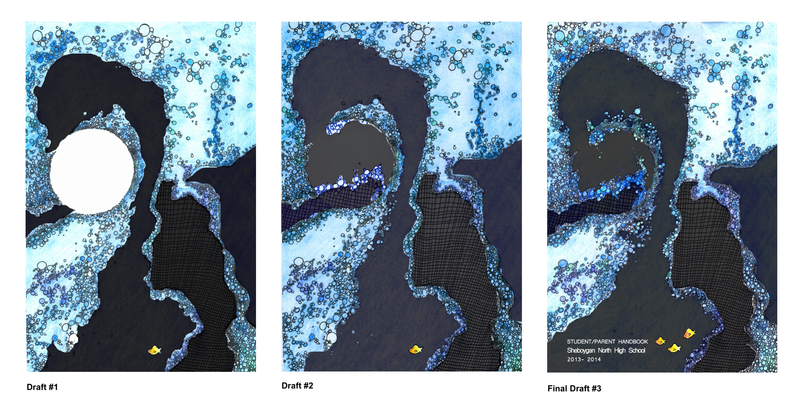 Lauren stated that “I knew that I wanted to incorporate the elements of water in the design, but the idea developed as the design was being created. Mr. Juarez gave me a couple critiques that helped me to develop a better overall artwork. I have never had a critique before as a student. It was a very motivating process and it helped me to create a design I am proud of”. Image above: Lauren’s design took several drafts to reach a mutually agreed upon design. Art Foundations 2 students are working on a clay project, “Storytelling through Ceramics”. Each student created a real or imaginary story, which will be transferred onto their clay project. The story could be based on a positive experience, something they saw or can be totally made up. This project was influenced by a Vessel with Ceremonial Scene dating back to A.D. 690-750, carved ceramic with traces of pigment by Campeche, reputedly from Jaina Island, Mexico, Maya culture, Chochola style, late Classic period, A.D. 600-900 I saw during my visit to the Amon Carter Art Museum in Fort Worth, TX.